Deborah Jeffrey ’82 is like a modern-day Marquis de LaFayette. 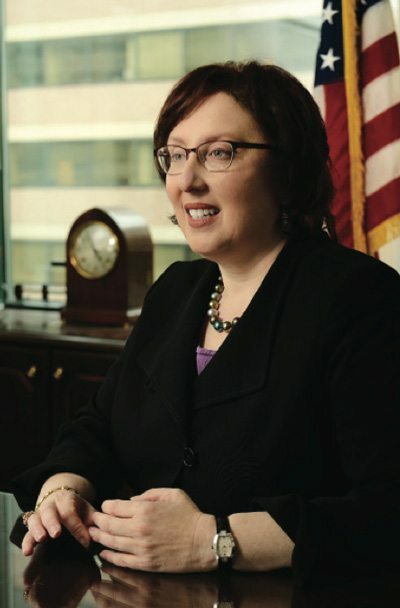 For the past two years, she has served as inspector general of the Corporation for National and Community Service (CNCS), the nation’s largest grant maker for service and volunteering. The $1 billion federal agency administers AmeriCorps, VISTA, Senior Corps, and the Social Innovation Fund, along with the national call-to-service initiative United We Serve. She was nominated to the post by President Barack Obama in November 2011 and confirmed by the Senate in June 2012. Telling the unvarnished truth is the principal job of the 73 inspectors general in the federal government today. They provide oversight, serving as the taxpayers’ independent eyes and ears in the major federal agencies. By law, Jeffrey is empowered to review and investigate whatever CNCS and its grantees do, in order to prevent and detect waste, fraud, and mismanagement and to recommend changes to make the programs more efficient and effective. She reports directly to Congress and heads a staff of 17, including criminal investigators, auditors, and evaluators. Jeffrey’s interest in holding government accountable began early. She recalls spending the summer of 1973 absorbed in the Senate Watergate hearings, and the following year prevailed upon her parents to take her to the House impeachment hearings. She was 12 years old at the time. It was an early lesson in maintaining integrity through independent oversight. Jeffrey says her time at Johns Hopkins encouraged the independence of mind that is one of the cardinal requirements for an inspector general. “JHU’s Chaplain Chester Wickwire once told me that religious cults [then prevalent at other colleges] never gained any traction at Hopkins because Hopkins students don’t need external affirmation,” she said. Graduating Hopkins at age 20, Jeffrey went on to Harvard Law School, where she served as editor-in-chief of the Harvard Civil Rights–Civil Liberties Law Review. After graduation, Jeffrey launched a legal career that would soon be defined by successive achievements, starting with a judicial clerkship for Harrison L. Winter, chief judge of the United States Court of Appeals for the Fourth Circuit, and culminating in partnership at the boutique litigation firm of Zuckerman Spaeder LLP in Washington, D.C. Many of her 25 years of practice were devoted to defending high-profile white collar cases. She represented one of the few senior Enron executives to emerge unscathed and successfully steered senior CIA officials through congressional and criminal investigations. Jeffrey’s interest in becoming an inspector general arose from defending government executives in inspector general investigations. “I saw firsthand the terrible consequences of investigations that were slanted, poorly conducted, or dragged on for years,” she says. “When I looked for an opportunity to serve, this seemed like an area where my skills could make a contribution.” The White House was quick to accept her offer to serve. She joined CNCS during a challenging time in the agency’s history, with the arrival and departure of five CEOs in five years, partisan wrangling in Congress over the agency’s future, and higher standards for stewardship. Looking forward, Jeffrey hopes to rewire CNCS for success. “The mission of the agency appeals to me greatly, in using national service as an effective vehicle for solving problems and meeting social needs,” she says. “So I would like to leave CNCS with the structures in place to achieve its potential—stronger, more efficient, and less vulnerable to waste.